Bushmaster rifles are some of the most popular AR15-style rifles because of their accuracy, reliability, value and customer service. A Bushmaster rifle's barrel is machined from the best grade of Chrome-Moly Vanadium steel, and Bushmaster offers more than 87 different barrel configurations on their rifles. The bores and chambers on Bushmaster rifles are chrome-lined, offering several advantages over plain steel bores - chrome-lining can double the barrel's life; the chrome protects against corrosion; it increases velocity and improves chambering; and it reduces lead, copper and powder buildup for faster cleaning. The receivers on Bushmaster rifles are machined from high tensile strength aircraft quality aluminum forgings rather than castings. The fit of the receiver to the upper is as tight as can be and the receivers on Bushmaster rifles are hard anodized finished, then coated with a nickel acetate sealer for maximum wear. 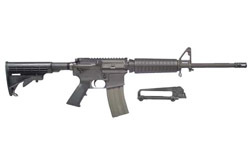 This is a lightweight, accurate, and very lethal rifle. I have put 500+ rounds through it without the slightest problem. Easy to strip & clean. M16 mags work very well, also. - D. N.